I can’t believe I’ve never shared a how-to post for preserved lemons. These are THE ingredient that makes Moroccan cuisine what it is. A Moroccan pantry simply cannot exist without a jar of preserved lemons. Most often they are used in tajines though you will also find them in salads and fish dishes. The reason I’ve never shared a recipe is pretty simple. I’ve never had to make the lemons. We usually get a giant jar from my mother-in-law when we’re returning from Morocco and they last me until our next trip. I know that not everyone is this fortunate so today I’m sharing a very easy way to make preserved lemons. The hardest part might be the few weeks you have to wait to use them! Really those are all of the ingredients. Lemons, salt, and a tight sealing glass container. I recommend using organic lemons and sea salt but you can really use any lemon and any salt – even table salt. You will want to really scrub the lemons well and dry them off. 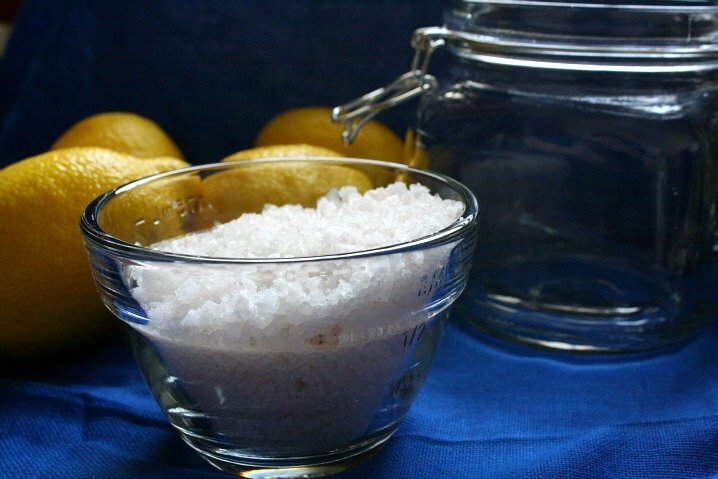 Be sure to also clean out the glass jar with hot, soapy water and dry completely before adding the lemons and salt. After you’ve gathered your ingredients begin by cutting a lemon. You will want to cut through the skin but DO NOT cut all the way through. Cut in half the other way, again taking care not to cut through the lemon. You can leave it in 1/4 slices or you can cut diagonally to create 8 segments. 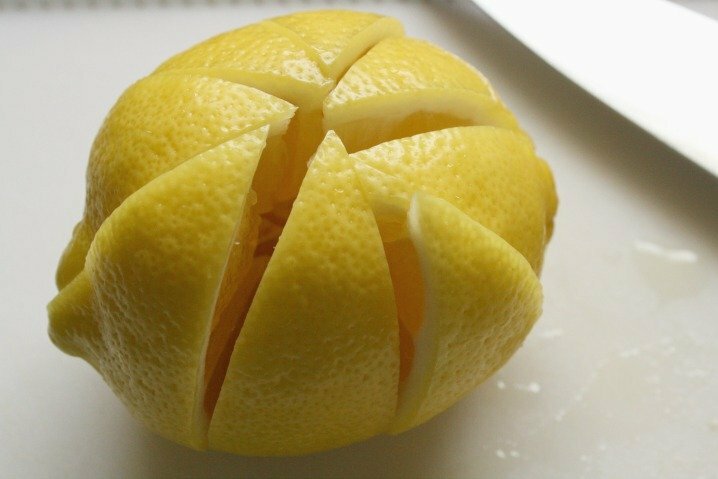 I can not stress enough that the lemon should remain whole, just cut down to one side. Squeeze some of the juice into the jar and fill the lemon with as much salt as possible. 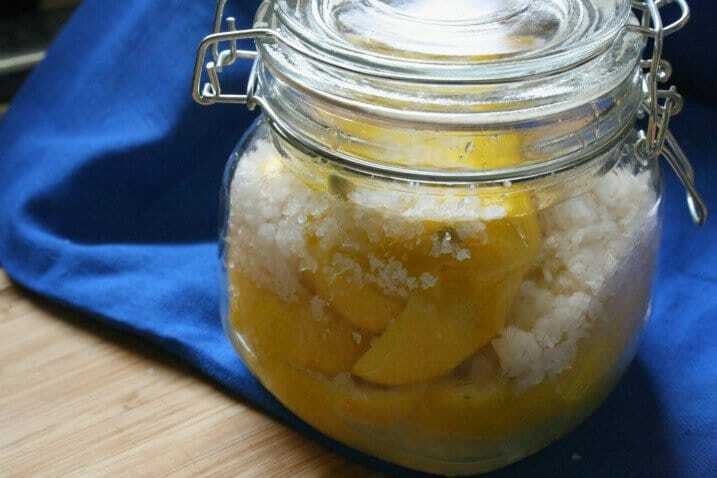 Place the lemon into the jar and add more salt if it falls out. Continue this process until the jar is packed tight with lemons. You can cut and segment a few lemons if you need to to make a tight seal. Close the container and place in a cool, dark location. After a few days check the lemons and add another if the others have begun to break down. Avoid opening the container too much. It is very important to limit air exposure of the lemons. Even after they are ready to use, keep the container closed as much as possible. When you’re ready to use the lemons remove a piece from the jar. You can remove the membrane and rinse off the rind to reduce the salt, however in most recipes you don’t need to. Most often I toss in 1/8 or 1/4 of a lemon straight out of the jar. As the lemons break down they will create a liquid, almost like a syrup. This is great to use in marinades or for added punch in a salad dressing. Once the lemons have been in the jar for 3-4 weeks they should look like this picture. The rinds will be sot and pliable, the color tinged brown. If you taste the liquid or the lemon that has been produced you will see it’s a mix of sweet and salty. Lemons will keep for many months, again in a cool dark place, so only make as many as you think you’ll use in that time! Okay, I think I can handle this one. In a few weeks I will be able to make an awesome tagine! woo hoo. My mom used to make a spicy version of this … more like a lemon pickle and it used to taste great. Now maybe I can try that using this recipe. thanks !! My friend visits Morocco once a year to see her in laws and she has brought me many wonderful treats. She told me about the preserved lemons. I would love to try and make them someday! what a great DIY post, love this!! Awesome! JOOC, why is it important to leave the first lemon whole? From what I’ve learned, if you cut them into pieces they won’t take the salt as much as if you leave them whole. So instead of preserving they might just shrivel up. If you can get just whole lemons that are cut but not separated into the jar it’s ideal, but it’s just not always possible – so keep them as whole as possible. Slicing just enough to keep a lemon joined yet divided, makes retrieval easier and that amount pulled out is generally about the right amount to scrape off the pulp and then slice thinly. What a fabulous thing to share with the world!!! Thank you!! Amanda, I love this post – I’ve heard so much about preserved lemons and the amazing flavour they impart on dishes. Thanks so much for the tutorial! You’re a lucky gal, getting your supply from your mother-in-law. Thank God for parents – I haven’t had to buy rice since moving out 4 years ago because my father-in-law always buys it for us, lol. It’s awesome isn’t it? Preserved lemons are sooo amazing – I hope you try them one day! I didn’t realize it was so easy to preserve lemons! lol! Right? I’ve seen so many tutorials that have all kinds of ingredients. Once I finally asked for the “real” way to make them I was floored that it’s just salt, lemons and time. Homemade anything always tastes better. I can see how your preserved lemons would make a tajine super-duper special. Thank you for sharing this gem, Amanda. I have never made or eaten moroccan cuisine but I have always wanted to make preserved lemons. Oh I hope you do try it one day! I can’t believe I have never made preserved lemons… what a fabulous recipe! Looking forward to trying it. This is so cool! 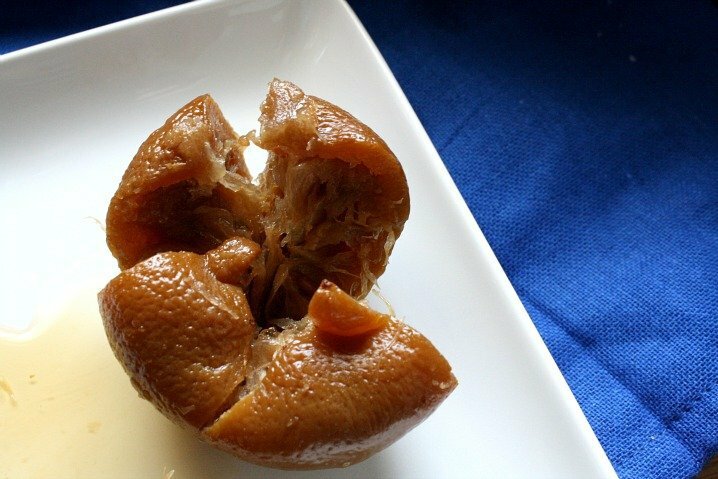 I definitely want to try out some preserved lemons in my kitchen now: thanks for sharing this!!! Fabulous recipe for preserved lemons. I love this recipe. Never tried to make these before, mostly because I’d never know what to make with them! Any suggestions? Loving this tips thanks for sharing I will definitely try at home! Preserved lemons have been on my to-try/make FOREVER! Thanks for the reminder…they sound amazing. I love recipes that also teach – and this certainly does. Great post! Yay, now I know what to do with lemons!! I always end up buying too many and there’s only so much lemonade one can drink, even one who loves lemons like I do 😀 Moroccan cuisine is one of my favourites and something I want to learn to cook better. So looking forward to trying this! Thanks for sharing this recipe! Recently there have been a few recipes I wanted to try that called for the preserved lemons, and I wasn’t sure where to get them. Now I can just make them myself! It’s much much cheaper! I’ve seen them sold for as much as $20-25 for a jar of 4 or 5! Ooh I love your preserved lemons and they sure could pump up the flavor dept in any dish they’re added to 🙂 Would love to try this!! I bet these provide amazing flavour to a dish. Do they ever do the same with oranges? I’ve never seen them with oranges. The salt somehow “sweetens” the lemons so that it has a really unique taste. I’m thinking with oranges it may just get bitter. Might be worth an experiment! I’ve never preserved anything, but it’s amazing what salt and time will do! What a wonderful how-to. Thanks for such a unique recipe. I have never heard of this, but what a cool idea. Oh my gosh, I can just imagine what these babies can do to dishes! YUM! I´ve been meaning to make preserved lemons for the longest time. Thanks for all the great tips! And for a traditional recipe. Do it! So simple – the hard part is just waiting for them to be ready to use! I’ve never preserved lemons (or anything else for that matter). This is so simple and I can imagine what a great concentrated flavor they must add to a dish. Very nice! 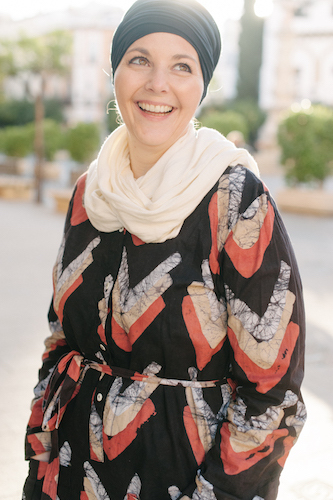 I have just started getting into Moroccan cuisine and this will be on my to do list, thanks for sharing!